Welcome to another post in our Brommapojkarna series! We’ve already seen the Season Summary as well as the Academy Report for the 2021 season, which ends the fifth year of the series. We’ll briefly pause with a look back at these five years and also glance into the future. 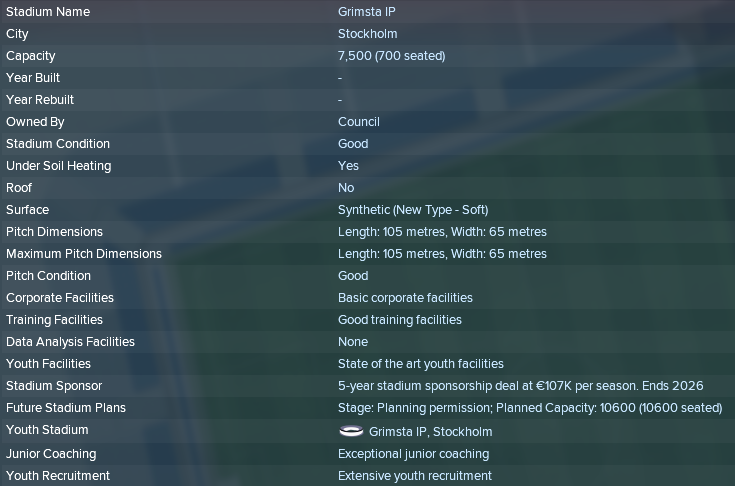 Five seasons have passed since I started the FM18 save with Swedish talent factory Brommapojkarna and also decided to try blogging about a save for the very first time. I must say that I’ve been enjoying it massively, both the playing and the writing! Hopefully you have enjoyed reading this as well! This “bonus post” will take a brief look at the five seasons passed and more importantly look five seasons ahead. At the start of the save Brommapojkarna had just won promotion to Superettan, the 2nd tier of Swedish football, after a couple of tough years. However, displaying a fast-paced, technical style of play during 2016 they quickly became media dark horses for an immediate promotion back to top division Allsvenskan. With an excellent youth setup but no money at all the strategy was fairly straightforward: build on the Academy and sign cheap/free players! We managed to win promotion back to Allsvenskan in our first season and have earned places in the top three in every season since the return. If you look at our record you can see some crazy consistency over the years! 2 wins and a second place is really good! We’ve had three attempts at qualifying for the Europa League group stage and in our third attempt we finally managed to get through! There are only two true Legends so far: late captain Pontus Segerström and former superstar Anders Limpar. Other names you might recognise are Icons Albin Ekdal and John Guidetti. The players from our save that have managed to appeal to the fans enough are Icons Joachim Edvardsen and Lucas Crispim and Favoured personnel Kevin Kabran, Léo Paoli and Victor Gyökeres. Qualify for Champions League EVERY YEAR. This would really put us in the driver’s seat in Swedish football both reputation-wise and financially. In order to achieve this we need to win Allsvenskan every year since Sweden only have one Champions League spot, but if Allsvenskan would just climb a few positions on the European ranking we’ll have two spots, which would make it a whole lot easier! Only sign players aged 21 or younger. I will only accept three exceptions to this rule: I will be allowed to sign over 21-year-old players IF they are former BP players and/or Swedish Internationals. The third exception is if the player is brought in to function primarily as a tutor, because of great Determination and/or Personality. Financial stability. At the end of 2026 we must have at least €50M in the bank. Make EVERY Academy player a professional footballer. It’s easy with the wonderkids, but at least I tend to just send away the young ones that fall behind over the years. I won’t allow this to happen anymore. I will try to get EVERY player that enters the Academy a professional contract before they turn 22. This means that I’ll keep some players around that will never make it at BP, just to give them enough footballing education to make a football living elsewhere! Get a player with a BP Style rating of 60 or above. This means that the player will need an average of 15 in all twelve attributes counted towards the BP Style Rating, which will be difficult but not impossible. Preferably I’d like to have this player come through our Academy, but I won’t hesitate to buy a player like this if I find one matching the transfer policy above. I really look forward to the next five seasons where we’ll hopefully manage to win Allsvenskan and start establishing ourselves as Swedish giants. The Academy will bring some great players in coming years, which will help us a great deal in achieving this! I hope you enjoyed this little bonus episode. In the next episode we will take a look at the 2022 season, where we’ll hopefully win our first Allsvenskan title! This entry was posted in FM18 Stories, Football Manager 2018, The Bromma Boys | @MikaelinhoFM and tagged brommapojkarna, fm stories, fm18, football manager, sweden, swedish allsvenskan. Bookmark the permalink.